Nevertheless, the DOT pressed ahead with the fine. “When consumers shop for air travel, they have a right to know how much they will have to pay,” said Transportation Secretary Ray LaHood. 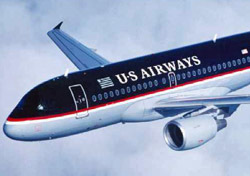 The AP reports that the DOT and US Airways negotiated a penalty, and that US Airways did not admit to doing anything wrong. This is the latest in a series of aggressive DOT penalties over the past few months. The agency recently fined Spirit $375,000 for various consumer violations, and its forthcoming tarmac delay policy is already giving the airlines fits. As for this fine, let’s face it—$40,000 is little more than a nuisance to a commercial airline. Compare it to the $27,500-per-passenger penalty for tarmac delays longer than three hours, and this fine looks downright paltry. I take it more as a reminder to the industry that the DOT is paying very close attention, and that any and all minor infractions could be caught, penalized, and blasted to the press. Readers, do you think a brief and, according to US Airways, accidental glitch is worth a fine?